Personnel: Cannonball Adderley (alto saxophone); Milt Jackson (vibraphone); Wynton Kelly (piano); Percy Heath (acoustic bass); Art Blakey (drums). Riverside (1128). Includes liner notes by Orrin Keepnews. Digitally remastered by Joe Tarantino (1989, Fantasy Studios, Berkeley, California). Of course, alto saxophonist Julian "Cannonball" Adderley played with Miles Davis on several classic sessions, and his collaborations with Bill Evans on 1961's KNOW WHAT I MEAN and with Wes Montgomery on 1960's THE POLLWINNERS are widely beloved. 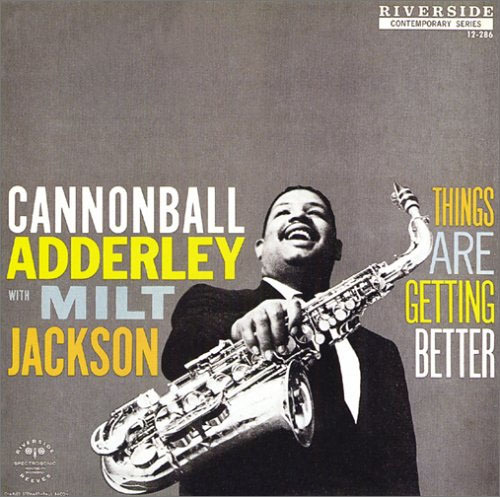 But this 1958 date, where Adderley and vibraphonist Milt "Bags" Jackson go head to head, may be the finest of Adderley's collaborative sessions. Jackson, forever remembered as an integral member of the Modern Jazz Quartet, is the greatest vibes player in jazz history. He creates powerful solos with the distinctively mellow percussion instrument. Jackson's inimitable playing meshes beautifully with Adderley's hard-bop style, whether on such originals as "Groovin' High" or on standards like Cole Porter's "Just One of those Things." Any album featuring either of these players is worth hearing. An album showcasing both–with powerhouse drummer Art Blakey, bassist Percy Heath, and pianist Wynton Kelly, to boot–is an absolute must-own. This title provides ample evidence why Cannonball Adderley (alto sax) is considered one of the masters of his craft. Here he joins forces with Modern Jazz Quartet co-founder Milt Jackson (vibes) to create a variety of sonic atmospheres. They are backed by the all-star ensemble of Wynton Kelly (piano), Percy Heath (bass), and the one and only Art Blakey (drums). The moody "Blues Oriental" opens the set with Jackson immediately diving in with his trademark fluid runs and shimmering intonation. Adderley counters with a light and lively line that weaves between the rhythm section. The optimistic "Things Are Getting Better" is a good-natured romp as the co-leads trade and cajole each other into some downright rollicking exchanges. This directly contrasts with the sultry "Serves Me Right," which allows the combo members to demonstrate their collective musical malleability. The interaction between Adderley and Jackson sparkles as they entwine their respective playing with an uncanny singularity of spirit. The cover of Dizzy Gillespie's "Groovin' High" contains another spirited performance with some thoroughly engaging improvisation, especially during Adderley's voracious solos. "Sidewalks of New York" bops freely as Jackson unleashes some sublime licks against a hearty and equally boisterous sax. Adderley's "Sounds for Sid" demonstrates his uncanny ability to swing with a strong R&B vibe. With drop-dead timing and profound instrumental chops, this cut is undoubtedly one of the best from Adderley's earliest canon. The album concludes with a jumping reading of Cole Porter's "Just One of Those Things." While Wynton Kelly has been uniformly solid, his interjections stand out here as he bridges and undergirds the two as they banter with flair and aplomb. When Things Are Getting Better was issued on CD, two bonus tracks supplemented the original seven-song running order. These consist of alternate takes of "Serves Me Right" and "Sidewalks of New York." In the case of the former, it can be reasonably argued that this outtake might emotively best the version initially chosen as the master. This disc can be recommended without hesitation to all manner of jazz enthusiast, as it quite literally offers something for every taste.